Residents in Brigham City no longer need to worry about what to do with their unused or expired prescription drugs thanks to the efforts of the Brigham City Police Department. Residents may now drop off prescription or over-the-counter medications (no needles or sharps) in a collection box which is located in the lobby of the Brigham City Police Department at 20 North Main. 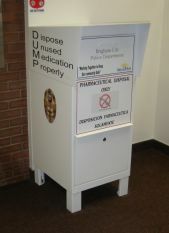 Citizens can place their unused medications/drugs into the collection box anonymously. They will not be required to provide any personal information nor will they be required to pay for the disposal service. The medications will later be retrieved and incinerated. The Drug Collection/Disposal Program will provide a safe, legal and environmentally acceptable drug disposal method for citizens. The safe disposal of medications protects water quality, keeps drugs out of the hands of criminals and lowers the potential for accidental overdoses by children or the elderly. Disposing of medications by flushing them down the toilet or sink is now thought to be a contributing factor in water contamination. The alternative of disposing of medications through garbage collection may still result in compounds leaching into the landfill, also impacting ground water. 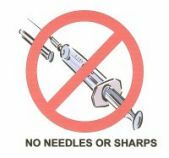 Consequently, the disposal of medications by incineration is the preferred method. Residents are encouraged not to keep expired or unused medications as emergency preparedness storage. After expiration, pharmaceutical compounds can deteriorate, lose effectiveness, and may even be harmful. Storing may also create a danger for children through accidental or intentional usage. The Brigham City Police Department hopes this new Drug Collection/Disposal Program will aid in preventing illegal use of prescription drugs. Law enforcement has been noticing a trend away from the traditional gateway drugs of alcohol and tobacco to prescription medications. Part of the problem is that prescription drug abuse is perceived as "less serious" than either tobacco and alcohol use or illegal drug use because prescription drugs are originally obtained legally. The Brigham City Police Department advises parents to never keep any prescription medication in your home that is no longer needed. Any potential benefit of doing so is simply not worth the risk. For more information, please contact the Brigham City Police Department at (435) 734-6650.